thankful today for the bounty i receive-not forgetting that which nature provides me right out my back door. and the other trees and veggies i’ve planted are looking good as well. it’s encouraging. there is nothing like a garden to keep me firmly planted on solid ground. 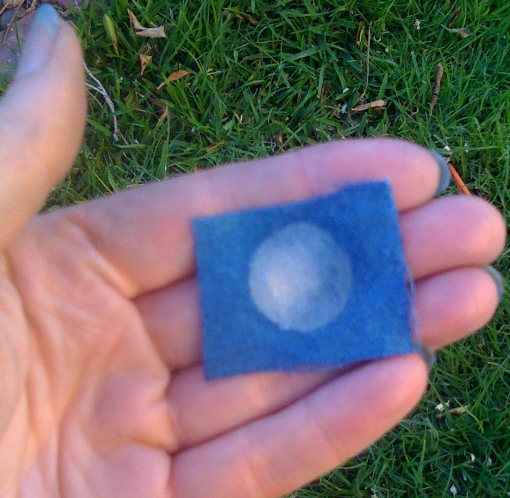 This entry was posted in shibori and tagged life on May 10, 2010 by shiborigirl. Well, here it is March already. I spent several days buried in paperwork, tying up the loose ends of 2008, finished and filed my taxes and submitted the FAFSA aps- always a good thing to put behind you. You know what I’m talking about if you are not independently wealthy and have kids in college. I continue on here with one foot in front of the other while life for my dad is closing in and he is turning inward more and more. There has thankfully been a steady stream of sisters there since I returned and they and my mom along with hospice care have been keeping him comfortable, humored, and in good company in these final days. My sister told me today that he had been making odd hand motions these past two days and they finally decided he was trying to tie imaginary knots. They gave him some string to work with and that seemed to satisfy for a bit. He also communicated a dream he had last night about being in an airport traveling but that he hadn’t yet arrived-wasn’t sure where he was going. And as I went about my day today I kept returning to these thoughts. I see him, his mind busy, his hands trying to tie up life’s loose ends as he makes his way home. It’s a comfort of sorts. 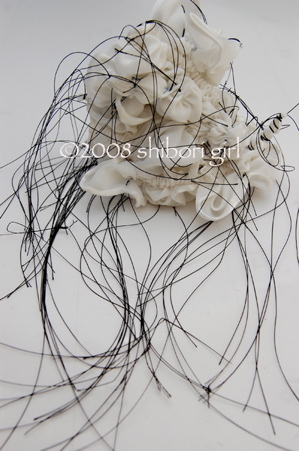 This entry was posted in shibori and tagged dad, life, loose ends on March 3, 2009 by shiborigirl. 1. Having a surface marked by irregularities, protuberances, or ridges; not smooth. Well, that’s what he called it when we talked. An understatement to say the least. I’ll be taking a bit of a break here to spend some time with him over the next week. For starters. I haven’t posted much info yet on my next show which begins on January 15 (through the 18th) in Ontario CA at the Road to California show. This is taking the wind out of my sails at the moment. I am teaching a Friday night class (go here to register online) that runs from 7-10 PM. 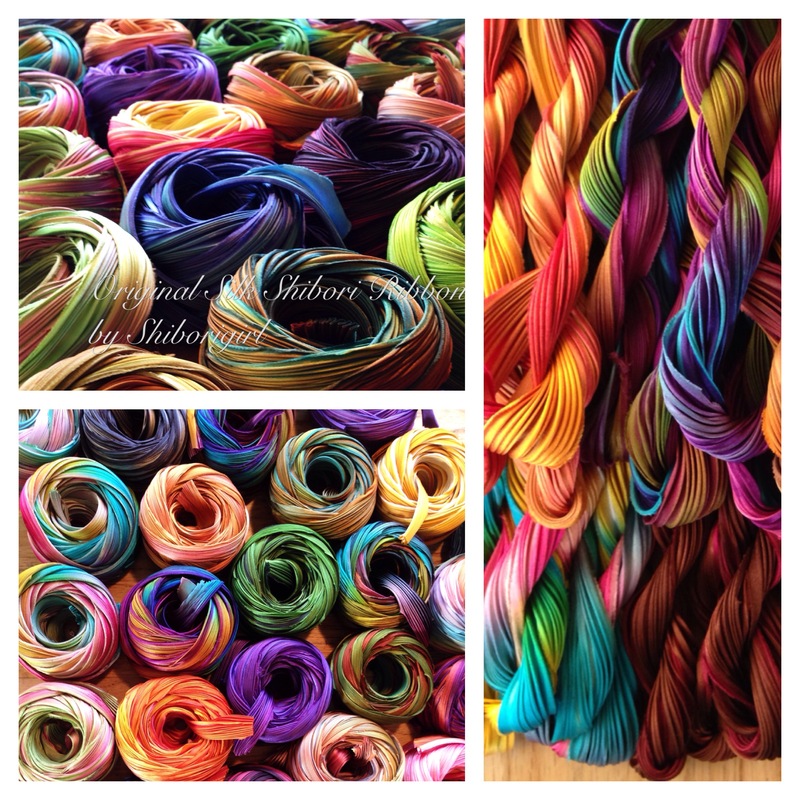 We will have all three hours for making various silk shibori ribbon flowers and wired jewelry. The class kit (fee $40) includes 3 yards of the ribbon ($45 value) plus a variety of other supplies we will be using. The class itself is $35- not bad for three hours and is limited to 20. I’m not sure how many spots are still open (will post as soon as I hear back from them) but this was a late addition to the class listings which are mainly sold out. For me, a big part of teaching others to engage their creativity and learn a process is discovering each student’s mode of learning. This is more difficult online of course and also difficult in a short 3 hour workshop. But I still enjoy the challenge. 2009 promises to be full of challenges and I hope you’ll be there with me. This entry was posted in art, artists teaching art, flowers, shibori, shibori ribbon, silk shibori ribbon flowers, where to find my shibori, workshop and tagged life on December 27, 2008 by shiborigirl.